Seeking shelter in a Parisian cafe from a sudden rainstorm, John Patterner meets the exotic Sabiha and his carefully mapped life changes forever. Resonant of the bestselling Conditions of Faith, Alex Miller’s brilliantly realised novel tells the deeply moving story of their lives together, and of how each came undone by desire. Strangers did not, as a rule, find their way to Chez Dom, a small Tunisian cafe in Paris. Run by the widow Houria and her young niece, Sabiha, the cafe offers a home away from home for the North African immigrant workers at the great abattoirs of Vaugirard who, as with Houria and Sabiha themselves, have grown used to the smell of blood in the air. When one day a lost Australian tourist, John Patterner, seeks shelter in the cafe from a sudden Parisian rainstorm, a tragic love story begins to unfold. Years later, while living a quiet life in suburban Melbourne, John Patterner is haunted by what happened to him and Sabiha at Vaugirard. He confides his story to Ken, an ageing writer, who sees in John’s account the possibility for one last simple love story. When Ken tells his daughter this she reminds him, ‘Love is never simple, Dad. You should know that.’ He does know it. But being the writer he is, he cannot resist the lure of the story. 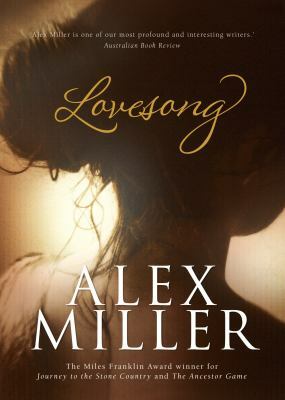 Told with all Miller’s distinctive clarity, intelligence and compassion, Lovesong is a pitch-perfect novel, a tender and enthralling story about the intimate lives of ordinary people. Like the truly great novelist he is, Miller locates the heart of his story in the moral frailties and secret passions of his all-too-human characters. Wonderfully written, did not like main character. Should have been called ‘Lust’. Own obsessions interfered with relationships. Good narrating technique. Selfish man character. Cultural attitudes came into play. Had to meet wife more than half way. Fantastic story women’s biological clock. Loved the book, author looks into the heart of characters. Sympathetic to wife. Bruno is flattered by Sabiha. Would not recommend to anyone. Cultural overtone to the whole story. Good study of human relationships. Need to belong. Husband spineless. This entry was posted in Fiction and tagged Alex Miller, Book Group, book review, Love Song, Parramatta Library by admin. Bookmark the permalink.